The increasing debate on the economic benefits of public goods' provision has motivated me to write this book. 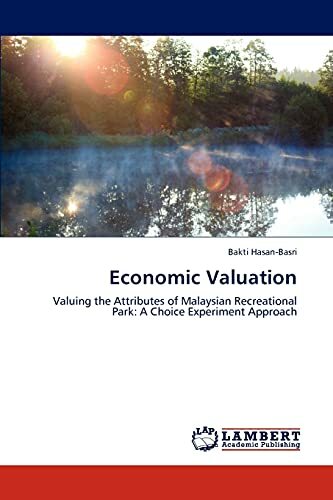 Using a choice experiment approach, the book explores how the approach could be applied to measure economic benefits of recreational parks in Malaysia. The content in this book includes the design, implementation and analysis on how to conduct the choice experiment approach. This book will be a valuable source of information to those who are interested in the choice experiment analysis such as students, researchers, consultants and professionals. It is hope that the knowledge shared could help to generate interest on the needs to preserve parks for the current and future generations of Malaysians. Dr Bakti is a Senior Lecturer at the School of Economics, Finance &amp; Banking in UUM, Malaysia. He obtained his PhD degree in Environmental Valuation from the University of Newcastle, UK. His research interest are in leisure and environmental economics, particularly the development and application of economic valuation methods.